Amelia Akehurst Lines's diaries and letters provide an extraordinarily rich record of the attitudes and values of an average American woman of the mid-nineteenth century. Lines was a young New York schoolteacher whose ambition drove her to seek new opportunities in rural Georgia. 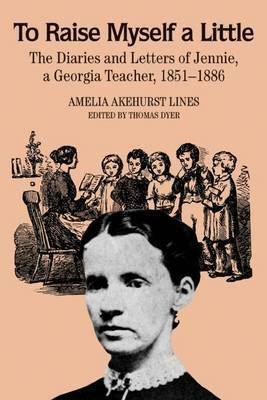 Her letters and diary entries provide keen observations on Georgia society and yield a great deal of information concerning the family, child-rearing, and other facets of everyday life in both the North and the South. Lines's life, says historian Thomas Dyer in his introduction, is testimony to the mythical quality of the nineteenth century's conventional wisdom that hard work, piety, and personal commitment were all that was needed to reap the promise of American life.